Zagarzazú or Balneario Zagarzazú is a resort village in the Colonia Department of southwestern Uruguay. 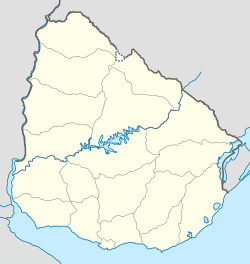 Zagarzazú is located on the coast of Río Uruguay, north of the city of Carmelo and just south of Route 21. To the west of the resort, is the Four Seasons Resort of Carmelo. To the north of the hotel and the resort is situated a big golf course. In 2011 Zagarzazú had a population of 96 permanent inhabitants and 165 dwellings. According to El Pais, the majority of the dwelings are rented by people from Carmelo either for summer vacation or as residence during the whole year, as many of them are employees of the Four Seasons Hotel. A statue of the founder of the resort, Isidro (Chiquito) Zagarzazú, can be found at the end of the entrance road, near the beach. Just east of the Zagarzazú resort, is situated the "Aeropuerto Zagarzazú of Carmelo" (Zagarzazú Airport). This airport was built along with the resort by Isidro Zagarzazú. "Aeropuerto Zagarzazú" was later donated to the City of Carmelo as a means of making it an International Airport. Since its donation, there has been political pressure to make it a Domestic Airport again, in order to increase traffic to its neighbouring airport, the "Aeropuerto de Colonia". According to Mr. Parodi, subdirector of Tourism at the time, in 2009, a movement of 20 privately chartered flights per day was recorded in this International Airport, transporting people who came to play golf or to stay in the Four Seasons Hotel. Much controversy has begun taking place due to the issue of the airport, which, if turned to Domestic, would break the clause and the basis on which the airport was initially donated. If this happens then the airport donation clause will be voided and the airport should be returned to the Zagarzazú Family. The beach of Zagarzazú is reminiscent of the resorts of the Costa de Oro of Canelones Department,[original research?] though the number of visitors is much smaller. ^ "Censos 2011 Colonia (needs flash plugin)". ΙΝΕ. 2012. Retrieved 30 August 2012. ^ a b c "Colonia, al otro lado del río" (in Spanish). El Pais, Uruguay. 2009. Retrieved 2 April 2013. ^ "1963–1996 Statistics / Z" (DOC). Instituto Nacional de Estadística de Uruguay. 2004. Retrieved 13 July 2011. Wikimedia Commons has media related to Zagarzazú, Colonia. This page was last edited on 9 April 2019, at 05:52 (UTC).